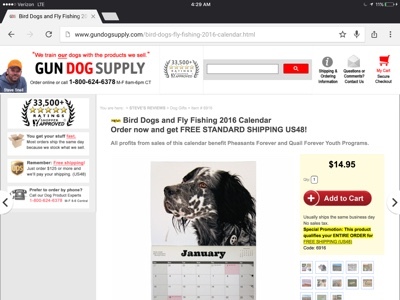 This is a great calendar, available for purchase through our friends at Gun Dog Supply. All proceeds will go towards youth events at Pheasant Forever and Quail Forever. The photos are a result of a photo contest on the 'Bird Dogs and Fly Fishing' Facebook group. BDFF, as it is known, is a closed group of dedicated bird hunters and fly fisherman who share experiences, ideas, stories and wisdom. We especially thank Steve Snell, of Gun Dog Supply, for his generous contribution in the making, printing of the calendar- at no cost to us or benefit to him- to support a worthy charity. This is a limited run of calendars. Order yours while they are available. I suspect they will sell out quickly and will be a prestigious addition to any bird hunter or fly fisherman's collection.